Waiting for news: Milad Jafari with a photo of his wife Mojgan Shamsalipoor. 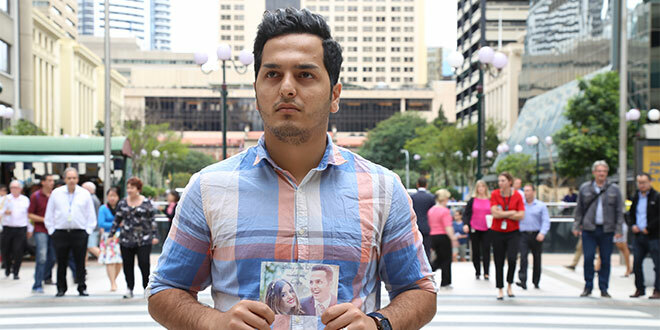 IMMIGRATION Minister Peter Dutton has refused to step in and allow the release of young Iranian asylum seeker Mojgan Shamsalipoor who is in detention in Brisbane. The 22-year-old woman has been held in immigration facilities in Darwin and Brisbane the past two years and faces deportation, despite the impassioned pleas of her community support group and her 22-year-old husband Milad Jafari. “She is my wife. I love her so much. Mojgan has done nothing wrong,” Mr Jafari, an Iranian refugee with permanent resident status in Australia, said on the day the couple’s story was featured on ABC TV’s Australian Story during the week. Ms Shamsalipoor’s case has galvanised the community at Brisbane’s Yeronga State High School, where she was studying to complete Year 12, before she was taken into custody. “There are still legal avenues being pursued, but we will not give up fighting for Mojgan,” the school’s deputy principal Jessica Walker said. State and federal politicians from both sides of politics have also lobbied for Ms Shamsalipoor’s release. Ms Shamsalipoor fled Iran with her brother in 2012 to escape brutal treatment and being forced to marry a man aged about 60. Her mother scraped together funds to send her to Australia, protected by her older brother. After arriving by boat from Indonesia, she sought asylum and was eventually granted community detention in Brisbane. She met her future husband, Mr Jafari, at a youth camp and two years later the pair married in Brisbane. Mr Jafari and his family had been granted refugee status and he was attending Yeronga State High. Soon Ms Shamsalipoor was also permitted to attend the school. However, when the Department of Immigration determined that Ms Shamsalipoor did not qualify as a refugee, she was taken back into detention at the Brisbane Immigration Transit Accommodation at Pinkenba. Yeronga State High teachers negotiated day release so Ms Shamsalipoor could continue her schooling. In August last year, she was forcibly moved to Darwin’s Wickham Point Detention Centre following an Immigration Department decision to place rejected Iranian asylum seekers back into detention if they did not voluntarily return to Iran. Supporters rallied for Ms Shamsalipoor. Darwin Bishop Eugene Hurley was amongst those to visit her inside the Darwin detention centre. “I visited Mojgan regularly in detention and I find it unfathomable she would not be allowed to be reunited with her husband,” Bishop Hurley said. Ms Walker was one of several teachers from Yeronga State High who also visited and helped her complete her final months of high school. “She did really well. She passed all her subjects and received a school award for commitment and perseverance,” Ms Walker said. Two months ago Wickham Point Detention Centre was closed and Ms Shamsalipoor was sent back to detention in Brisbane. Ms Walker is now able to visit her former student every week. But she said the burden of being locked up – and the uncertainty of her status – had taken a toll. “In Wickham Point she was very down. She had support but she was disassociated from reality,” she said. “When she flew back in to Brisbane, saw the city lights, she said a curtain had been lifted from over her eyes. “At first she wasn’t eating or moving out of her room, not sleeping at night. We certainly had significant concerns. Mr Jafari is now able to visit his wife in Brisbane detention, at least once a fortnight. Their meetings are tense and uncertain. The Department of Immigration has told Ms Shamsalipoor the Minister had declined to reconsider her case. Without further legal intervention, she would be expected to leave the country. Mr Jafari works at North Lakes at his family carwash business. He said he drove past Mr Dutton’s Strathpine electorate office each day on his way to work. “When I drive past I silently beg Mr Dutton to listen to my heart. This is not about stopping the boats, or looking tough in front of other politicians. This is just about my wife and me,” he said.